Syrian sources local to the al-Jazeera region recently reported that the United States has done a deal with Daesh (ISIS) in return for tens of tons of stolen gold, according to Hazem Sabbagh. Hazem Sabbagh says that new information suggests that the gold is payment to the United States in return for safe passage out of Daesh's last stronghold, in parts of Deir Ezzor (Deir ez-Zor), Eastern Syria. 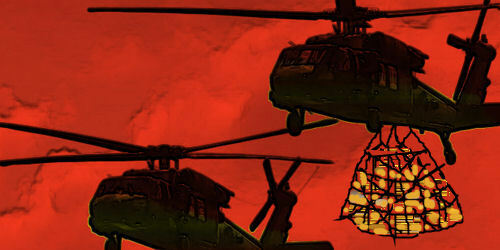 Local sources say that US army helicopters moved the gold bullion on Sunday, during darkness, and that the gold was subsequently taken to the United States. It sounds as if Daesh has been in the habit of accumulating gold and other valuables, as you would expect from theives and terrorists. This gold stash was kept by ISIS in rural Deir ez-Zor, described by Sabbagh as ISIS's 'last hotbed in the al Baghouz area'. The Americans have previously taken gold from other ISIS hideouts and ISIS reportedly estimates the total amount of gold taken from their stashes by the Americans in the area of 50 tons. Sources have said that ISIS leaders and members had barricaded themselves in with 40 tons of gold and tens of millions of dollars which they stole from various parts of Syria and Iraq. After all, this is what war is about - getting stuff through violence. ISIS has profited from the chaos sewn by US-NATO professionals to kick-start a warmonger franchise, and the United States, which sees itself as the world's war-baron in chief, is shaking ISIS down. Meanwhile, none of this gets reported by the Deep State owned corporate media. The United States (and not the Syrian Arab Army) defeated ISIS? I posted this comment in respose to Syrian War Report – March 21, 2019: ISIS Influence Is Still Strong In US-controlled Part Of Syria (21/3/19) | South Front. At the memoment it has been 'marked as spam' and not published. In my past experience, other posts in which I have included links have also been marked as spam. Hopefully this will be shortly fixed by the South Front administrators. This is yet another article which fails to reconcile the different explanations of ISIS and the illegal United States' intervention in Syria. For most of the Syrian conflict since March 2011, it seemed to me that ISIS/Al Quaeda/Al Nusra Front/Syrian 'Democratic' Front (SDF)/... were allies  of the U.S., Israel and Saudi Arabia against the popular elected President of Syria (Syria's press conference the United Nations doesn't want you to see https://www.youtube.com/watch?v=ZnFQd4wBXnk). This criminal war, mostly done by proxies of the U.S. has cost (by one outdated estimate) the lives of 400,000 Syrians, including 80,000 Syrian soldiers. Now we find that the U.S. is, in fact, (illegally) in Syria to fight against the same terrorists they I thought they had previously supported!? So, is the United States now is a force for GOOD in Syria? So, why aren't they cooperating with the Syrian government (and Russia, Iran and Hezbollah) against the terrorists? Any reporting of the Syrian conflict which fails to at least acknowledge these apparent contradictions is deficient in my view. Part of the cover story for Western support of those terrorists was that, as bad as they were, they were not as brutal as the 'regime' of President Bashar al-Assad, so clearly Syrians would be better off if Western aid to ISIS resulted in their victory.